Crafted of beautiful Paduak, a hardwood from Africa that when cut is an orange color that darkens into a deep burgundy patina with use and time. 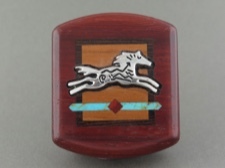 On the lid is a primitive horse spirit white metal inlay with a strip of turquoise. 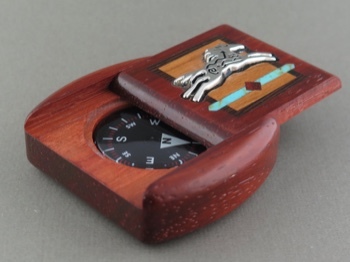 Hidden inside is a water-filled compass that will always help you to find your way. Box measures 2 x 2 x .5 inches. Easy fit for pocket or purse or knapsack!